Eastern DataComm announced today that it has received the ShoreTel 2016 Circle of Excellence Award. 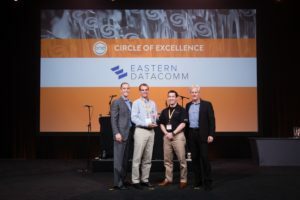 ShoreTel, Inc., the leading provider of brilliantly simple IP phone systems with fully integrated unified communications (UC), announced the winners of sales and customer satisfaction achievement awards during the 2016 Annual Champion Partner Conference in Orlando, FL. Only the top 10 partners in the country earn this distinction, which recognizes outstanding success among a large group of ShoreTel partners. Learn more about ShoreTel premise, hybrid and hosted solutions.